Hundreds of IT tickets are logged each day at my company asking for IT assistance. However recently, a colleague logged a "special" IT ticket requesting that IT fix the stairs in the car park because they are too difficult to walk up/down in stilettos. These stairs should be absolutely no problem to walk up/down with the stilettos (I'm allowed to say this as I wear stilettos everyday to work). 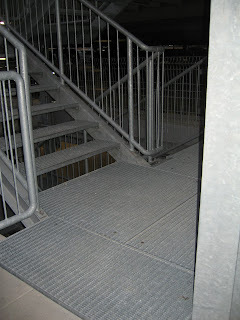 The metal grates occupy only the stairwell area of the garage. A practiced stiletto wearer would only walk on their toes when going up/down stairs so the stiletto part should not hit the floor, much less get caught in the grate. Plus, the holes are really small. Below is the (rough) translation of her email exchange with IT. Description: This morning I almost had an accident again in our parking building in front of the MPS building due to the dangerous steel banister. For all people who wear high heels it is not possible to pass the banister due to the grates. Could you please cover these grates? The metal grate flooring on the garage stairs are there to prevent ice from forming on the stairs in the winter. I suggest that you wear a 2nd pair of flat shoes to work and use these to walk up/down the garage stairs. If you still would like to request that the metal grate flooring be changed, please contact the building maintenance team. In my opinion, the metal grates are not necessary for safety. Why can’t you install other flooring, as seen on ramps AB&C? The option of wearing a 2nd pair of flat shoes to work is unacceptable. In addition, all the parking places on the lower floor are taken by 7:45. So women are compelled to park on the upper floors. Perhaps you could create a certain number of parking places designated solely for women on the lower floor? Ramps AB&C are closed in the winter as they become icy and are unsafe. Your idea of parking places for women was rejected by security. I find this solution unacceptable and plan to notify the worker’s union. Hopefully they will take care of this situation.